VW No Soundtrack — Benjamin Yung Jr.
As main sponsor of The Rock in Rio Festival, Volkswagen launched a special edition of cars with its name. To communicate it to a young audience we created a commercial where the soundtrack was missing. Why? To offer this space - exposure of 4 months on national TV - to any rock band that wanted to fight for it. More than 4,500 songs were submitted to the promotion. 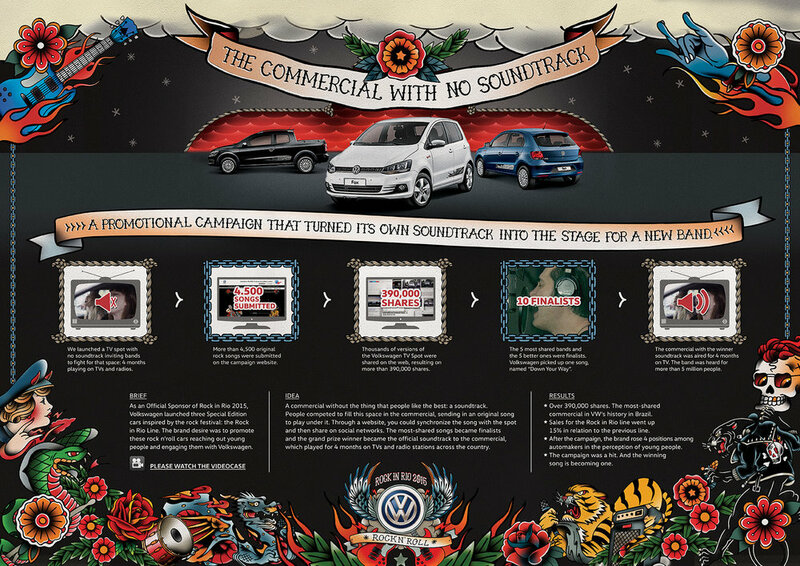 The commercial was the most shared of Volkswagen Brazil history, with more than 390,000 shares. More than 5.5 million people watched the commercial. In the end the winner became the soundtrack of the Volkswagen Rock in Rio Line commercial and got nationwide famous. Creative Directors: Benjamin Yung Jr. and Marcelo Nogueira. Art Director: Renato Butori and André Leotta. Copywriter: Rodrigo Resende and Felipe Cirino. Designers: Johann Vernizzi, René Corini, Simon Fernandez and Pedro Zucollini.